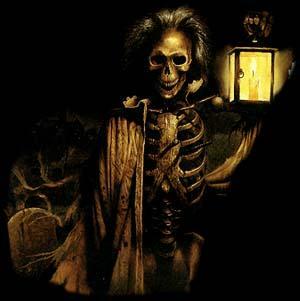 The lock is in the shape of a skull without the lower jaw. 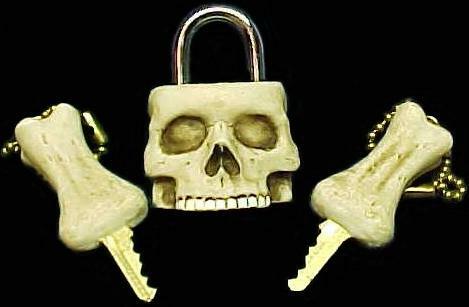 Overall lock size is 1 3/4" H. x 1 1/4" W. X 1 1/8" D.
Lock comes with 2 bone keys. Each key is 2" long. 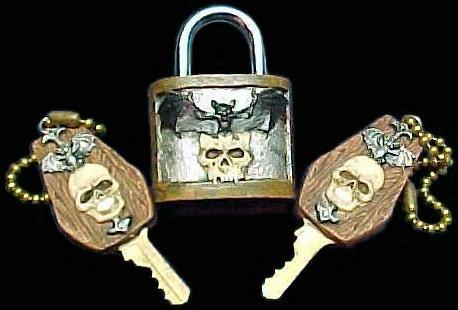 The skull lock is 1 3/4" H. x 1 1/4" W. X 7/8" D. and has a skull and bat on the front. Lock comes with 2 coffin keys. Each key is 2" long and has a skull and bat on each side.